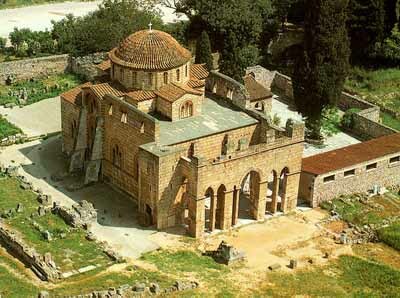 The monastery of Daphni is in Attica, near Athens. Daphni is one of three monasteries ( Daphni, Hossios Luckas and Nea Moni of Chios ) which belong to the same typological series and share the same aesthetic characteristics. The church was built on a cross-in-square plan with a large dome supported by squinches defining an octagonal space and decorated in the 11th and 12th centuries with superb marble works as well as mosaics on a gold background, all characteristic of the 'second golden age of Byzantine art'.